It’s pretty well-documented that the people with the least are more likely to share what they have than the 1%ers. -so moving. He said “I’m trying to worship our Creator through food”. His response to a time when he himself had no money is to create a world of beauty. Meanwhile the far right religious Trumpies try to foist their Hell minds on the rest of us. OMG! Started watching the PBS special on Mr. Rogers and on his first national show in 1968 was a segment on a border wall and fear of change in the backdrop of the Vietnam War. More than 50 years later and we are still dealing with an outmoded, ineffective, inhumane and racist idea if a border. Sometimes I just can’t. At least 25 Russian kids are infected with a type of tapeworm that causes potentially fatal infections in the lungs and/or liver. The food contractor lost their lucrative contract w academy and PUTINS CHEF ends up with it. Where boundaries mean nothing to them. Where their goal is to mentally exhaust you, gas light you and pretty much it’s all about them. Essentially avoid them at all cost. It is kinda hard to ignore what the President is doing. I think he qualifies to be an emotional vampire besides Narcissist and a pathological liar. So advice to stay away from them does not work for our whole Country. Just about sure both saw me as non-white. Allow me to just repeat it was fun responding. I’m sure you can imagine those details. If more people post after I included the fact I was “a 72-year-old white woman, not that it should matter,” I’ll have more fun with ’em. Check out the SNL skit on the Women of Congress; it is funny and kickass. Trump might be in jail by the time Election Day comes, Elizabeth Warren said on her first full day of campaigning. So… Trump voters are finding out now that their tax returns are upside down and that they owe money for the first time in 10 years. They're now discovering they voted for a conman. Am I supposed to feel bad for them? I don’t feel bad for them at all. In fact I urge all Trump supporters to buy as many MAGA hats as possible, use up all their savings …. to help pay for Trump family’s legal fees (read that somewhere). I remember when the 2017 tax law for the rich and infamous was made law that there were serious (bad) consequences for many ordinary Americans that would take effect when they file 2018 tax returns in 2019 and even worse consequences are slated to occur after the 2020 elections for the same kind of effect when voters file their 2020 returns in 2021. Very careful timing to give the GOP cover for the 2018 and 2020 elections. Deliberately timed. Let’s surprise them and send the GOP, including the liar-in-chief, packing when we vote in 2020! Is the Obama Diary no longer on Twitter? I checked it a couple of weeks ago, and it’s not there now. The sound of dog tags chiming was the only indication we had, years ago, that our beagles had managed to get a platter full of cooked beef short ribs onto the floor to be eaten in record time. They even got their mess all cleaned (licked) up before we caught them. Both were very happy that evening even if we weren’t. Mrs. O. is at the Grammys!!! OMG! She’s on the stage!!!! I saw that; the crowd went wild when Michelle tried to speak. She had to get them to calm down. Queen! Yep! We all ❤️❤️❤️❤️ Mrs. O! Yep we do love her. A moment of great beauty and goodness … people know …. Nine minutes in and the queen, Michelle Obama is on stage with Jennifer Lopez, Lady Gaga, Jada Pinkett Smith, and Alicia Keys. I’m so glad I decided to DVR the Grammys! I am not a fan of JoLo’s hat. It took me a long while to tell whom she was. I was turning the tv and came across the Grammys and guess who I saw? Our one and only …..Michelle Obama. If I knew she was going to be up there I would have been watching. I miss seeing her. I miss her. A factoid on Walter Jones: he’s one of just five House Republicans who voted NO on ACA repeal + tax law. He criticized both from the right. “Women need to ‘STEP UP’? What the hell does that mean? “PAY TO PLAY? Love this! She’s doing a great job too! The audience response to our Forever FLOTUS show how much we miss the Obamas in the White House. Michelle Obama – thanks to all who posted about her on the Grammys! I love that Michelle Obama just randomly shows up at the Grammys looking like Album of the Year. There are real issues facing our country right now — wages, healthcare, climate change — all bigger than @realDonaldTrump's name calling. I’ve seen comment from several Democrats about the passing of Republican Congressman Walter B.Jones of Farmville N.Carolina. I’ve seen were Speaker Pelosi tweeted about him. WATCH: We featured Jeffery Redding, the teacher who was just honored at the #GRAMMYs on @CBS. He won this year's Music Educator of the Year. Approximately 22 Veterans a day commit suicide. Would at least 22 of my Twitter friends please copy and tweet? (Not RT). 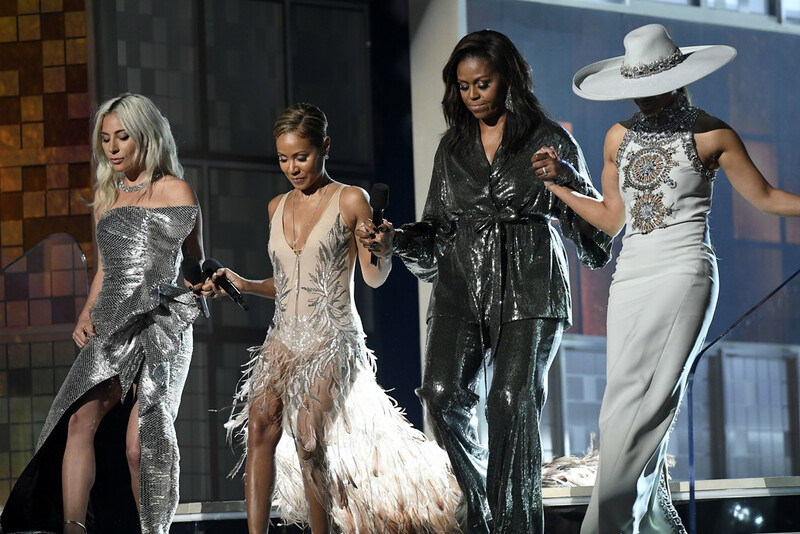 (L-R) Lady Gaga, Jada Pinkett Smith, Michelle Obama, and Jennifer Lopez walk onstage during the 61st Annual GRAMMY Awards at Staples Center on February 10, 2019 in Los Angeles, California. Host for the #Oscars? How about @MichelleObama? Q: They say you oppose legalizing weed. KAMALA HARRIS: That's not true. HARRIS: And look, I joke about it — half-joking — half my family’s from Jamaica. Are you kidding me? Q: Have you ever smoked? When fires ravaged parts of Tenn in 2016, Dolly Parton gave $1k/month to every homeless family until they could get back on their feet. She has used her fame to spread a message of love/acceptance. thanks to Deutsch for saying. -heh maybeTrump’s conspiracy to dismantle U.S. rule of law and the Constitution is giving global real estate crooks a bad name! Bravi!! Hit Trump and his donors in their pockets right off the bat. Says he’s immune and he may be lucky so far. But are we/his children immune to whatever illness he may be carrying? –Mega Duh. From the mid-19th century the germ theory of disease is so thoroughly documented. Is why we have Immunology and great detailed understanding of how our bodies battle viruses and bacteria. What is the right wing game here? Is it a pox on you situation? Is the President professing not to believe in the dangers of HIV Aids when he fires his Advisory Board? Or is the new generation supposed to be magically immune to that too. If I met him my hands would immediately go behind my back to avoid shaking his germy hands!